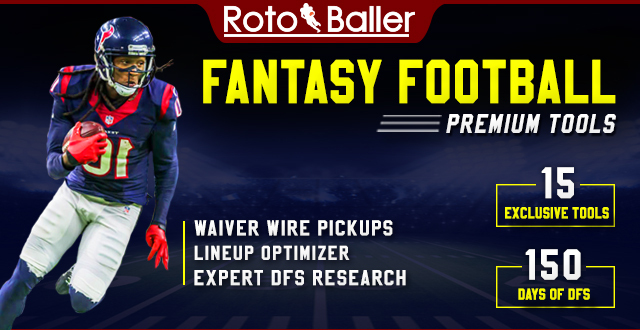 Each week here at RotoBaller, we provide the subscribers of our DFS Lineup Picks of the Week Newsletter with some of the highest quality advice for salary cap fantasy football for DFS weekly league sites. We also have lots of great DFS analysis weekly, so be sure to check back. Missed Out on the Fantasy Football Playoffs? Editor’s Note: RotoBaller is proud to be partnering with FantasyScore, our new and exclusive DFS partner. 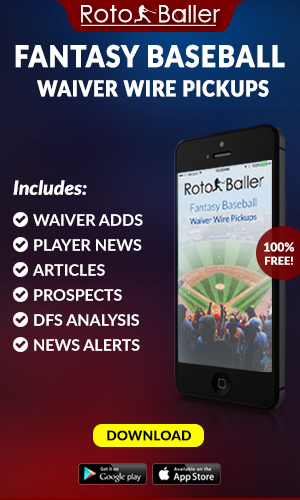 For RotoBaller readers, FantasyScore is offering an instant 50% deposit bonus up to $250. No other DFS site offers an instant match bonus like this! Other sites claim to provide users with matching dollars on their initial deposits. What they forget to mention is this is not an instant match, and you have to earn those “matched dollars” slowly over time, penny by penny. This can be misleading, and discouraging to new depositors. If you play salary cap leagues on any of the leading DFS sites, then our expert picks can give you the edge you need to win. Each week we analyze the player matchups, and the associated pricing across the sites to identify the sleepers and value picks to put together a winning lineup. With each newsletter, you will receive our well-researched weekly picks for each position, with both a “Strong Play” and a “Value Play”, and we will also include two or three budget buster tournament plays for each position. All in all, you will be receiving a minimum of 12 of our expertly hand-picked recommendations for your gaming pleasure! 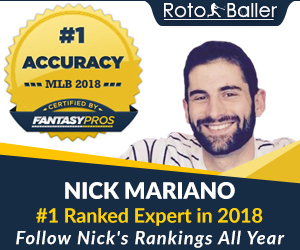 We’ve reprinted some of RotoBaller’s lineup picks from last week’s subscribers-only exclusive newsletter to give you an idea of the DFS analysis that we put forward each and every week. As you can see below, our experts had some sweet recommendations for Week 13, so hopefully you got in on the action! And if not, no worries, there’s still plenty of time to finish strong in Week 16 and 17. We recommended this stud to you in Week 14 and it paid big dividends. Now in Week 15, Matty Ice has another great fantasy matchup as he faces off against the Steelers at home. Pittsburgh allows the 8th most fantasy points per week to opposing quarterbacks, so even with the chance that Julio Jones misses this game, we think Ryan can still put up enough points to meet or surpass the 18.74 points per contest the Steelers defense is allowing every week. We are planning on having some DFS exposure in Week 15 to the 5th overall rated passer based on Pro Football Focus; in fact, we'll most likely be pairing him with one of our sleeper wide receivers below for optimal scoring opportunities in the big tournaments. We have a very short memory in fantasy football, and even shorter when playing DFS games. The fact of the matter is that all we can do is process the data and facts to the best of our abilities in the attempt to get a competitive edge against those who do less research than us. For Week 15, the lesser of two Manning' will be facing off against the NFL's worst defense versus fantasy quarterbacks, the Washington Redskins. The putrid 20.96 fantasy points per contest that they allow to quarterbacks should be enough to induce saliva and perhaps even some more alkaline-rich fluids. Last but not least, the Skins are the absolute worst rated pass coverage unit in the league by quite a margin over the Saints and Falcons, so don't have any reservations in trusting the potential Eli Manning holds for Week 15 of DFS action. The forgotten about man in Atlanta was banged up earlier in the season, but was called upon after Julio Jones's marathon performance at the end of Week 14's slugfest. He quickly delivered on the 3 late targets he received with 2 receptions for 11 yards and a touchdown. He's historically been a very effective possession receiver who fills in nicely when Julio or Roddy are limited or out with injuries, and given the fact that Jones did not practice on Friday, we feel the Mr. Douglas makes the sneakiest of upside sleeper wide receivers for Week 15 of DFS action. Only use this WR3 - Flex option if you've verified the status of Julio Jones because if he does play on Sunday, we must consider downgrading Douglas back to the almost useless WR4-WR5 status. The largely unknown second year wide receiver out of Washington State University will have to step up and fill some big shoes since Brandon Marshall won't be playing football for the rest of the 2014 season. The good news for fantasy owners in the know is that this guy is a 6'4" stud with some serious burner speed. That makes him a deep sleeper who is bound to go bonkers in Week 15 versus a very weak Saints pass coverage unit that grades out as second worst in the NFL. New Orleans is also allowing a chunky 25.92 fantasy points per game on average to opposing wide receivers making them one of the best teams to pick on when you need some big points out of your wide receivers. We'll be taking some tournament chances on this budget buster for Week 15 and we suggest you do the same if you're trying to stuff those stockings extra thick this holiday season. Reggie Bush was active in Week 14 and it did absolutely nothing to slow down veteran plodder Joique Bell. Even with the fact that we make fun of him for being kinda slow, the man is clearly the lead back in Detroit's offense and has gotten 20 or more touches in the last 3 contests and 23 plus points in his past 2 games..
We see more of this success in our DFS future for Week 15 as Joique will be looking to ring the Vikings' bell at his home stadium in Detroit. The Vikings are allowing the 9th most points per week to fantasy running backs and do not seem to be slowing down anytime soon in that category as they've allowed a healthy 16.65 fantasy points per game to the ground game over the past 4 weeks. Trust us when we tell you that the main man in Detroit's rushing attack will be in our RB2 slot in quite a few DFS lineups for Week 15 cash games and tournaments; will he be in yours? 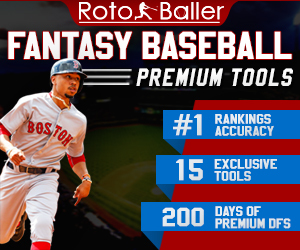 We've been on quite a streak lately recommending undervalued defenses for your DFS lineup and we're going to do our best to pull another DFS rabbit out of our RotoBaller hat. In Week 15 there are some really good options such as the slightly overpriced Ravens versus the Jags, but we are going to save a few hundo and entrust our tournament and cash game lineups to Bill Belichick's bunch, grading out as the 9th overall defense in the NFL based on Pro Football Focus. Darrelle Revis and hard hitting Brandon Browner will be suffocating the Dolphins mediocre receiving corps, and we simply don't see Ryan Tannehill eclipsing the 300 passing yards plateau for the first time in his NFL career in Week 15. With fairly low Las Vegas scoring total projections for this matchup howerving around 48 points, we think there is a good chance that the Pats put a good old fashioned defensive smackdown on their in-division little brothers. Get them into your DFS mix for Week 15 and hopefully you reap a huge return on your investment. 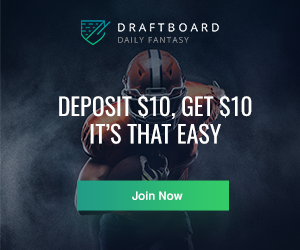 For the next few weeks of the NFL and DFS fantasy football season, RotoBaller is offering a ridiculously cheap price for our DFS lineup picks. Let's win some leagues! There's no reason to sit at home on Sundays and wish you weren't eliminated from the fantasy football playoffs. Instead of driving yourself up the wall for the next two weeks, get involved with the supremely fun fantasy games on FantasyScore. We've already given you a ton of reasons and the DFS ammo you need to unearth a few sleepers, so what are you waiting for? If you happen to be totally burned out on fantasy football for the remainder of 2014 (although we find that notion preposterous), try your hand at some NBA or NHL FantasyScore games and get ready for some of the most instantly gratifying fun of your fantasy sports playing life. After all, life is too short and watching sports take up a lot of our free time , so why not make it a little sweeter with DFS games? We're looking forward to another great week of FantasyScore action in Week 16, so sign up today and join the party fellow RotoBallers.